Partners of the European Project 'Graphene Flagship' at the University of Strasbourg and CNRS (France), together with an international team of collaborators, created new 'switches' that respond to light. Researchers combined light-sensitive molecules with layers graphene and other 2D materials to create new devices that could be used in sensors, optoelectronics and flexible devices. The study, recently published in Nature Communications, may lead to a variety of programmable applications in the next generations of smart electronics. Researchers within the Graphene Flagship designed a molecule that can reversibly undergo chemical transformations when illuminated with ultraviolet and visible light. 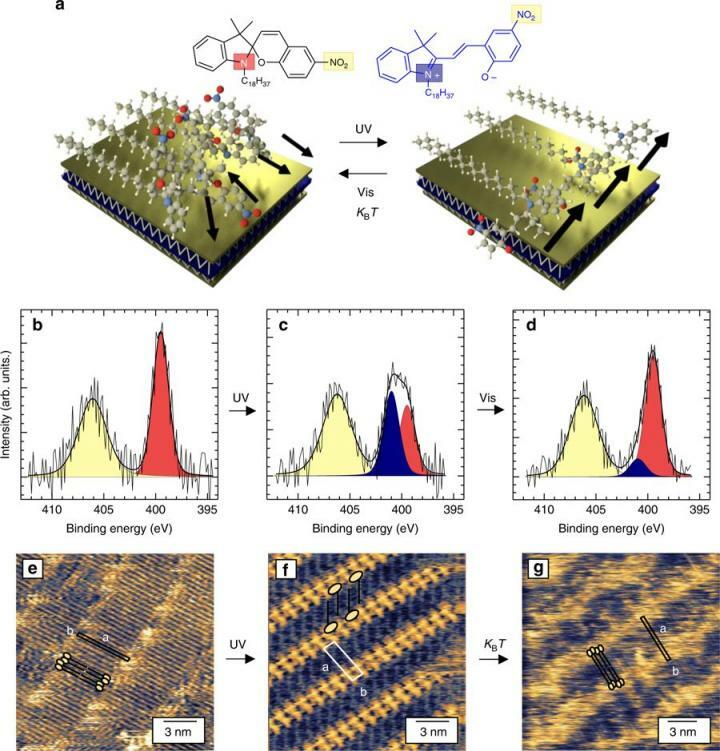 This molecule -a photoswitchable spiropyran- can be then anchored to the surface of materials such as graphene or molybdenum disulfide, thus generating an atomically precise hybrid macroscopic superlattice. When illuminated, the whole supramolecular structure experiences a collective structural rearrangement, which could be directly visualized with a sub-nanometer resolution by scanning tunneling microscopy. 'Thanks to this new approach, we can exploit the capacity of collective switching events occurring in superlattices of photochromic molecules assembled onto graphene and related materials to induce large scale and reversible modulation in the electrical properties of high-performance opto-electronic devices,' explains Paolo Samorì, lead author of the paper. 'This technology could find applications in the next generation of smart and portable electronics, with programmable properties,' he adds. Samorì also explains how this idea of tailoring molecular superlattices could generate a wide variety of new materials with tunable and responsive properties. 'To dial your functions! You only need to carefully choose the right molecules, the thus-formed superlattice will allow to maximize the change in properties as a response to external inputs,' he says. These advances, made possible by the collaborative environment of the Graphene Flagship, could lead to promising applications in sensors, optoelectronics, and flexible devices. Researchers now dream of high-performance multifunctional hybrid devices under control of nature's most abundant and powerful source of energy – light.